Are you currently in the market for a portable speaker, and you do not want any ordinary portable speaker, but rather, would prefer something that is capable of making its mark even when it plays Justin Bieber songs? Pyle Audio has got your back then, as you turn your ears toward the Street Blaster. The Street Blaster happens to be a mean looking boombox that packs a whopping 1,000 Watts of power. This full range stereo speaker system is capable of delivering a high output music listening experience, not to mention being compatible with Bluetooth as well as Near Field Communication (NFC) technology using any iOS and Android device. Apart from modern connectivity options, it will also have some room to accommodate traditional and old school devices, thanks to the inclusion of a 3.5mm input jack. 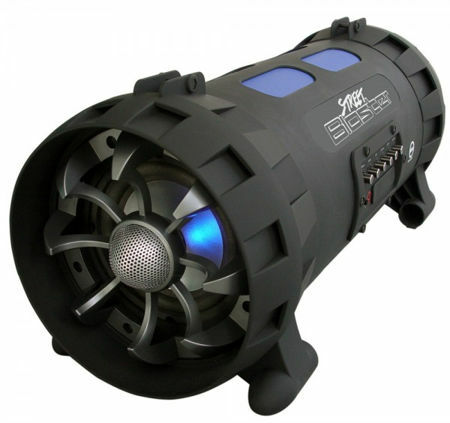 the Street Blaster has been specially designed for maximum bass response and performance, where it boasts of a high-powered cylindrical speaker housing, built-in digital amplifier and LED lights that will blink and pulse according to the tunes being played back for a top-notch listening and visual experience. Not only that, the Pyle Audio Street Blaster also happens to be portable and rugged in nature, being the ideal grab-and-go option for bands or DJs who require powerful, easily transportable sound. The boombox delivers wireless convenience so that you can use it in outdoor areas easily whenever there is no power outlet nearby. A full charge would see the Street Blaster deliver up to four hours of playtime, and there will be battery level indicators that inform you whenever it needs a trip to a nearby power outlet. The Street Blaster also comes with microphone and guitar inputs, letting bands rip anytime they want to have an impromptu performance. The inclusion of a USB port also ensures that the Street Blaster can charge smartphones and other compatible devices on the move, and if you are interested in picking one up for your own use, then the Street Blaster from Pyle Audio is available for $249.99. This looks like a new take on the wonderful JVC Kaboom Box of a few years back. I think it’s a faux pas to put the tweeters on the ends firing sideways, however. Because treble frequencies are more directional than bass, the tweeters should be mounted on the front panel, the way JVC had them. Balraj, aside from the connectivity options, what is the new technology at work here?